We're just...I can't even describe, adequately, how busy work is. We're all yelling at the phone to stop ringing. The boss finally had to tell someone, "No, we can't be there tomorrow" because we couldn't do the job. We just don't have the personnel. It's not just the field work. After that is done, there is the paperwork, the reports, to get out. Remember the "paperless society" touted 30 years ago. HA! Again I say, "HA!" Never, ever going to happen. Never. Digital reporting can condense 85 pages onto a CD, but as technology changes, being able to retrieve that information off an old CD is going to be a problem. 3.5 inch floppy, anyone? I have photos stored on a whole bunch of those and I don't know how to retrieve them. Anyway, I'm now working overtime to produce reports for all the field work I've done. Getting up, eating breakfast and getting out the door on time has been a problem for me now that I have RA. It takes a good 10 minutes to "warm up", so to speak, and it doesn't matter if I get up 10 minutes or 40 minutes earlier than usual. I seem to leave the house at the same time. But what if I got breakfast on the way, at least during this time period while I have to do reports? I'm making enough in overtime to cover the expense of breakfast and it's pretty much always the same cost. I stop at either Dunkin' Donuts or Panera. I could do this. My budget, for right now, would allow this. Everyone has a loyalty program. I hadn't joined Dunkin's yet and I probably get breakfast there more than at Panera. I get the same thing every time; a large tea and 2 donuts. 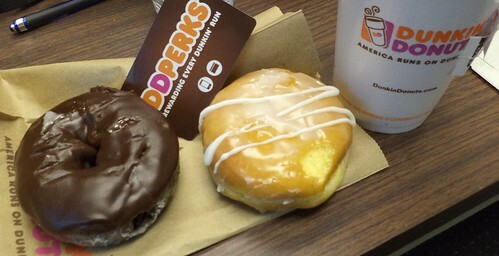 One donut is always the double chocolate and the other is the variable. On this date, it was the lemon filled. It's not the most healthy breakfast I could have, but it's quick and I can get into the office early with something satisfying to last until lunch. I earned a free medium beverage, which the guy behind the counter knew would be tea, and, I'll be earning other perks as I continue with the program. There is a Dunkin' a block from the office, but I will come here, to the one near me in Wheaton. They know me and I don't even have to tell them what the beverage is. As I was leaving, the guy behind the counter said, "See you tomorrow." Guess I have to go back. I think I can do that. I agree with you about the paperless society....it never happened and certainly didn't make things easier. If anything, it made more work for everyone!